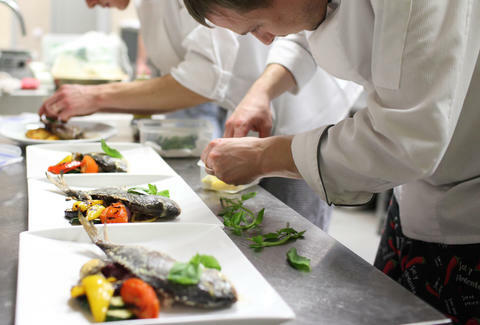 For professional line cooks, efficiency goes hand in hand with success. The dried-up adage "If you can't take the heat, get out of the kitchen," should be rebranded as "If you can't take the heat, 20 waiters asking where their orders are, your 300lb boss screaming at you, and a ticket line longer than a boa constrictor in 20 minutes or less, get out of the kitchen." Basically, you have to be fast. So for advice on getting quicker in your home kitchen, there's likely no better authorities than three former line cooks who've moved up the rungs of the restaurant world to become executive chefs. Here are tips from Justin Shoults (executive chef at Massachusetts eateries BRINE and Oak + Rowan), Jeremy Glover (executive chef at Newburyport, MA's Ceia Kitchen + Bar), and Adam Steudle (executive chef at Jasper’s Corner Tap & Kitchen in San Francisco), plus a few of my own tricks, because I'm the biggest kitchen hack I know. "People are intimidated by bigger knives -- and that's understandable. But using a big knife will make your cutting more efficient, you'll get straighter curts, and the knife will do the work for you," said Shoults. "I tell my cooks to clean as you go. I mean, it's a cliche but it's totally true. It will save you so much time," Shoults said. Steudle agreed: "I cannot preach this enough. It saves a massive amount of time, and streamlines the whole process." 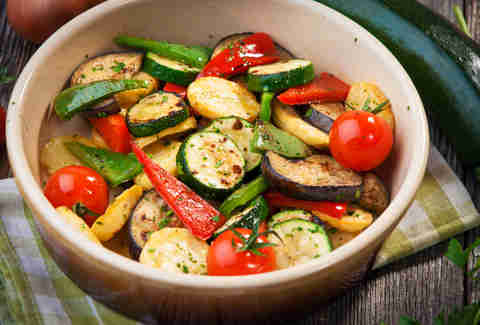 "Usually, I'll roast my veggies most of the way through, before I really get into cooking -- that way, you only need to pop them in the oven to finish them off. It really helps speed up the process and saves a lot of time... and oven space," said Glover. "Doing this is a lifesaver," said Steudle. "I keep oil, wine, pretty much any liquid I'll need in squirt bottles -- it's so, so much faster." This also works well with pancake batter! 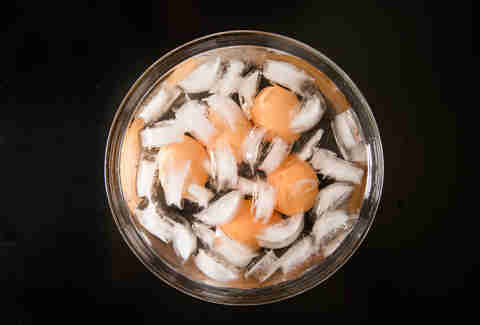 "After hard-boiling eggs, toss them in a pot or bowl of freezing water. They will be much, much easier to peel. If you can't do that, at least run them under cold water," Shoults said. "If you really want to get a fast, smoky flavor in your food, invest in a smoking gun -- they are excellent," Steudle said. Also, a pinch of paprika can add a faux-smoke flavor that takes a fraction of the time as cooking bacon does. 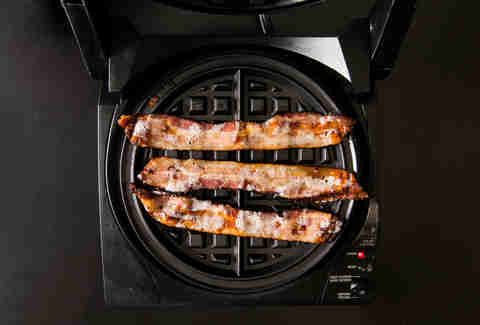 This is a ridiculously fast and super-easy way I fry bacon, while freeing up stove space for other dishes. "One thing I'd definitely recommend -- that we always do -- is having bags of stock frozen, in your fridge. Just pop one out when you need it, and you're ready to rock and roll," Glover said. Although one of the chefs considered this to be "super gross," I tried it out myself and wasn't totally disappointed. 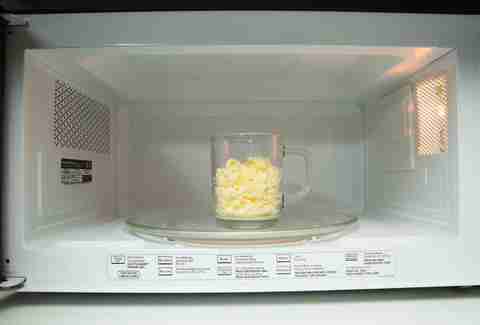 Put two eggs in a mug, add 1tbsp of water or milk (maybe a little salt, if you're into that kind of stuff), microwave for one minute, stir it up, then nuke it for another 30 seconds. Some may advise dropping ice cubes in soups or stews to quickly congeal excess fat to make it easy to scrape off. Don't do that. "A better option -- that won't water your soup down -- is to fill your sink up with cold water and ice, and put the entire pot inside. That will freeze the fat out," said Steudle. This is so obviously not obvious, it toes the line between stupid and brilliant -- much like I do. 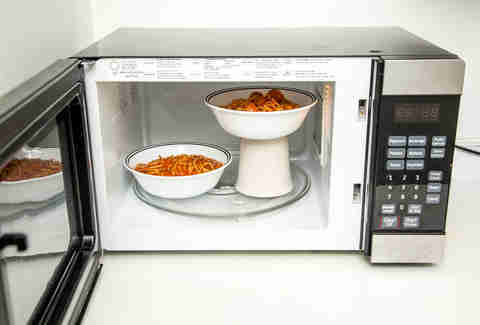 To microwave two bowls at the same time, place one atop a cup. Rejoice with your two newly smoking-hot bowls. To avoid cuts and slip-ups that obviously require immediate attention, and thus, time, "Always cut away from the body, put your hand in kind of a claw-like shape, and always keep the knife flush against your knuckles," Steudle said. "Put a wet towel under your cooking board so it doesn't slide around, and square off the bottom of round fruits and veggies so it lays still, and flat," said Glover. "It might seem counter-intuitive, but using a cast-iron skillet can actually save you a lot of time," Shoults said. "We cook a lot, and all I do is wipe them clean with a towel when I'm done using them, then once a week flip them upside and burn them out to fully clean them. 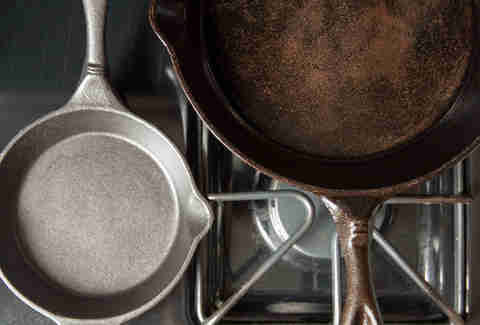 You don't have to clean them nearly as often, and the seasoning is already there, built up." "Do one thing at one time. It might make sense to multitask, but when you're cooking, especially at home, you need to focus on your recipe," Shoults said. "My mom is a horrible cook. She won't read recipes, and she tries to do everything at once. It never works out. You will save time in the long run, and short, by just focusing on the task at hand. Trust me on this." Wil Fulton is a staff writer for Thrillist. He's always multitasking. Right now, he's cleaning his cast-iron skillet. Follow him: @wilfulton.